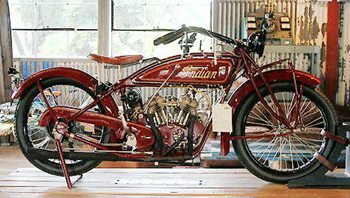 The Indian Scout motorcycle was a smaller, lighter (hence better handling) and faster version of the Indian Chief. (By "faster" I mean it accelerated faster but top speed was probably less, depending on gearing and the state of tune of the Scout and Chief.) 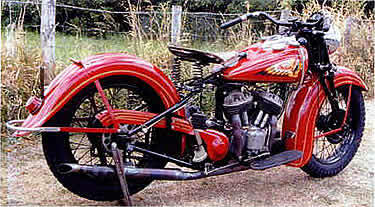 It was the sport model of Indian, like Harley's Sportster or V-rod is compared to the big touring "baggers". Hence the Scout was often used for racing and it was very successfully, even into the 1970's!. 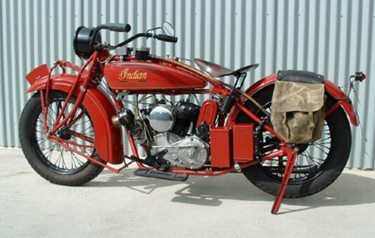 The Indian company made ordinary Scouts, Sport Scouts, smaller 500 c.c. Pony Scouts and military versions of the Scout named the 641 and 741. 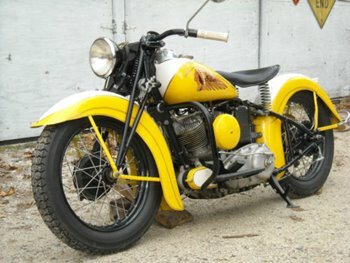 For details on the other two Indian WWII army models (Chief and 841) see the sister website www.IndianChiefMotorcycles.com . 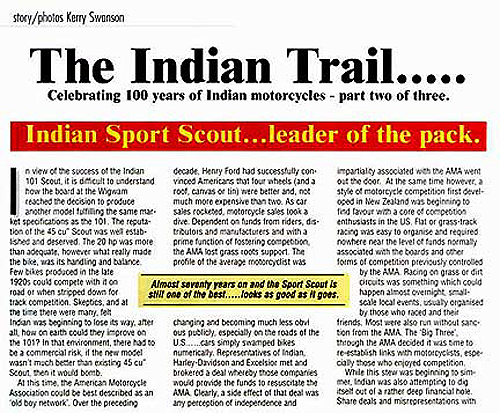 While today's Scout is not a racer it is comparable to the Harley V-Rod so keeps the tradition of being the "sport" model compared to the heavier Chief series of cruisers. 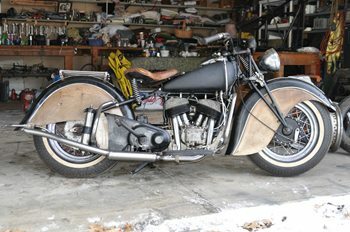 Below are photos of a 1922 engine and rider's view looking down at the tanks, then a right side view of the entire bike. .
Next we see a 1924 Indian Powerplus V twin displacing 600 c.c. 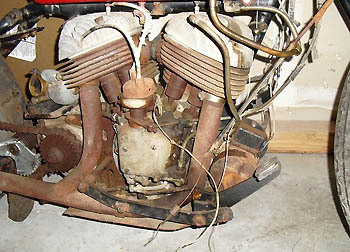 or about 37.5 CID, followed by two close up images of a 1924 Powerplus Scout engine seen from the right side. Here is a YouTube video of a British fellow starting his 1925 Scout. 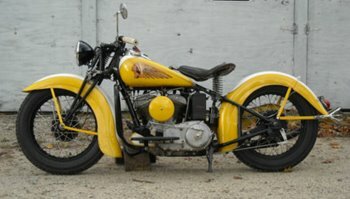 Now that we are finished with 1928, the "101" series of Indian Scouts which followed in 1929 (but only lasted for three years thru 1931) are considered very desirable and valuable because not only were they the first Scouts to have front brakes but mainly because they were lower and longer and more raked than earlier Scouts and they still had pure Scout frames which were a bit different and lighter than the Chief type frames. 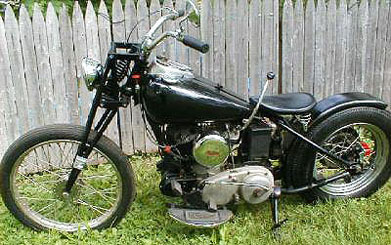 In 1932 the factory "homolgomized" and gave the Scouts a frame very similar to the heavy Chief frame. This slowed the Scout and changed its appearance and probably its handling. (It was no longer called 101, just "Scout".) 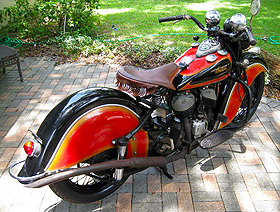 The adverse consumer reaction lead to the 1934 Sport Scout which had a lighter frame, different forks and aluminium alloy cylinder heads. 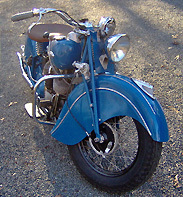 It lasted until about 1941, a production run of eight years. (During 1934-41, I assume there were probably a lot of regular Scouts as well as Sport Scouts built and sold. Nowadays only an expert can tell if a bike is genuine Sport Scout or just a plain Jane version disguised as a Sport model, e.g. with alloy heads. 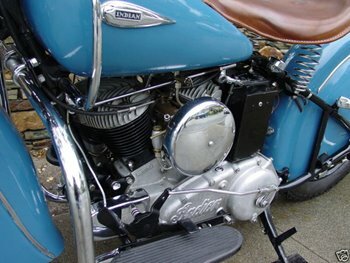 I think the genuine Sport Scouts had magnetos instead of battery and coil ignition (and probably higher performance cams and carb tuning). 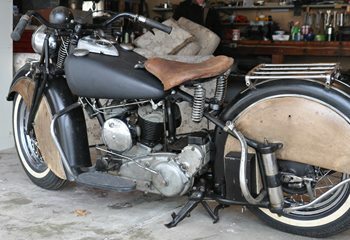 I have never seen a post 101 Scout without alloy heads and when I checked the photos below I could not find any with iron heads, and all have the same style of forks. 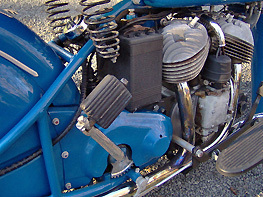 Possibly replacement cylinder heads are only available in aluminium so even restored regular Scouts get the alloy heads. The WWII military models from around 1939-41 were wimpy non-Sport Scouts. 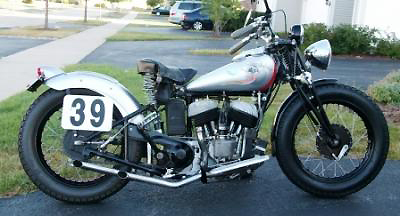 Here is a 1937 unrestored Scout that looks like a "runner" that does not need any work. 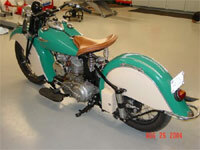 Here is a photo of an unrestored 1939 Scout, followed by two bobbers, followed by a fully restored one. Please support advertisers to keep this site alive. 1939 must have been a huge year for sales of Scouts. Here is a video from Youtube of a guy starting and riding his. 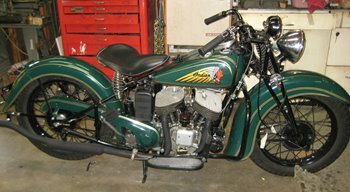 Below are two shots I took some years ago of a 1940 Scout which has a custom paint job, Harley style air filter cover and a bit of extra chrome. 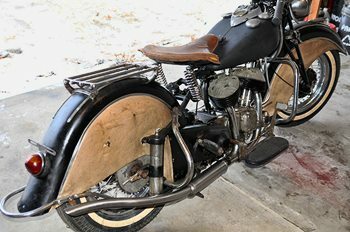 The whitewall tires were likely "period accessories". 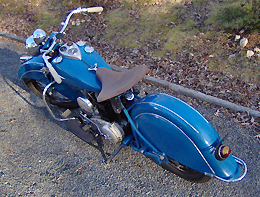 Next are shots of three recently restored (perfectly stock) Scouts, all 1940 vintage. One is orange, one blue and one olive (military color but glossy). The olive one is a Sport Scout, with a magneto. (Few if any actual military models were Sport Scouts, as the army usually opted for "plain Jane" versions of vehicles, being cheaper and more reliable.) 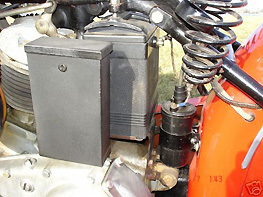 For the orange one we see a closeup of the generator and a closeup of the ignition coil, battery, tool box and seat springs. 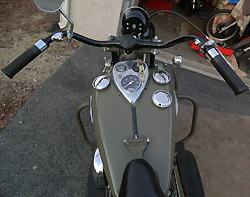 These bikes were on sale on Ebay. 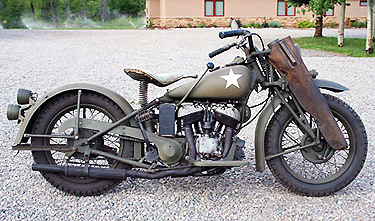 Here is an ex Army 1940 Scout bobber, from both sides. Pretty cool, eh? 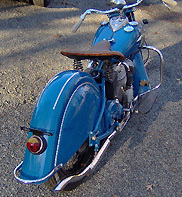 Next is a customized 1940 Junior Scout of 500 c.c. (30 cubic inches). 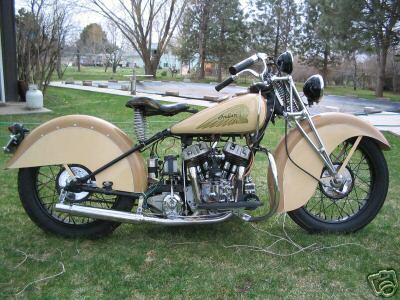 I doubt if the fenders are "correct" but the bike is very eye catching. 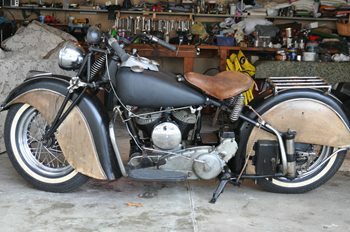 Compare the unrestored 1940 Sport Scout bike above with the restored one below. 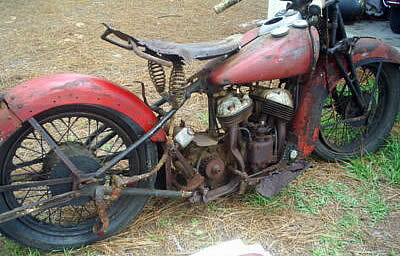 Further down is a 1940 Scout which has been chopped. 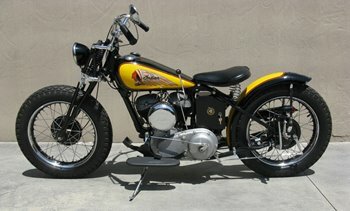 Here are some shots of a 1941 Sport Scout in a nice tan and matte black almost gray primer color combo:. 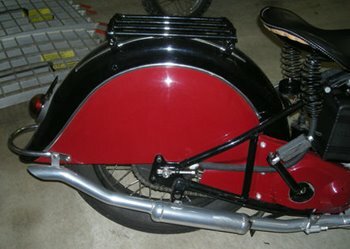 It has the optional 16" diameter wheels and chubby tires. 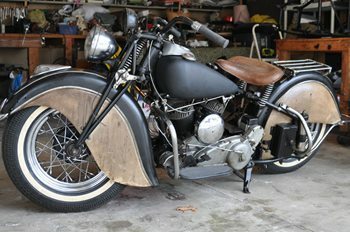 Below are a Left and Right view of Marilyn Crawford's 1941 Scout at the Old Bastards VMC rally in Sept. 2013. It has the 16" diameter wheels. 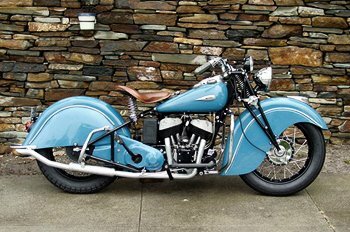 Marilyn and her husband Fred (on his 1947 Chief) rode the bikes across Canada a few years ago for a charity event, averaging 400 miles per day! 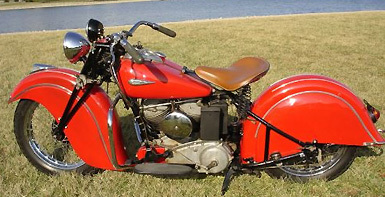 Here are three shots of a rare and beautiful 1942 Sport Scout seen on Ebay August 2014. 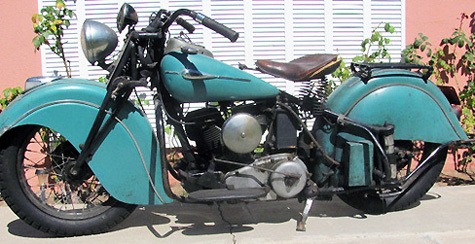 Below are typical WWII Indian models based on the civilian Scout. 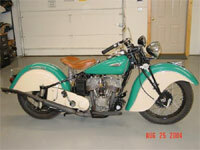 Model 741 means 500 cc built from 1941 thru 1945, 641 means the 750 c.c. version. (The muffler on the first bike is too short.) Not shown on this page are the Chief versions, e.g. 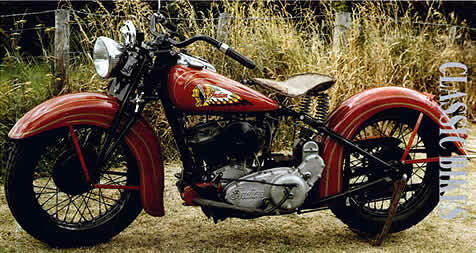 340 means a Chief of 1200 cc built 1940, 344 means a Chief built in 1944. I have seen 340's and 341's here in Canada a few times and it turns out my Dad rode one during the war, but only in Ontario as he was not sent overseas. (When France fell, a shipload of Chiefs destined for France were unloaded in Nova Scotia and expropriated by the Canadian army, and still have their metric speedometers which is handy since Canada went metric around 1975.) 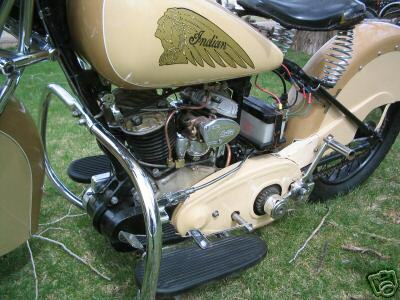 You can see some at www.IndianChiefMotorcycles.com. 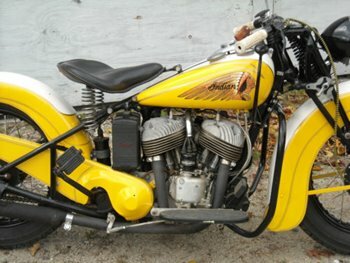 Circa 1939-40 the Canadian army ordered Indians (mostly Scouts and a few Chiefs) but the Scouts turned out to have quality control, reliability and "rapid parts replacement" issues so after a year or so Harleys were ordered. According to another source the same happened in the US Army, with few Scouts being ordered and instead many WLA's. Another Milwaukee v. Springfield victory. 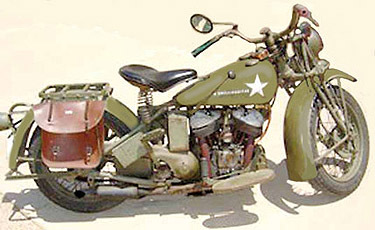 Another reason Harley profited from the war while Indian did not. 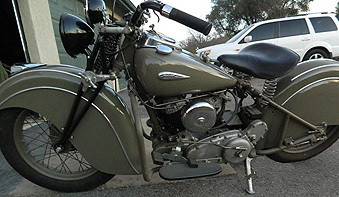 So over a period of about four years many Harley-Davidson V twin flatheads were built for the Allied forces, almost all of them 750 cc models based on the civlian model. W (not really standing for "war" as it predated the war but it turned out that way) was the model number for the civilian model, hence the WLA ("A" for American or Army) was built for the US Army mostly in 1942, and WLC for the Canadian Army mostly in 1943. ("C" for Canadian) One difference between the WLA and WLC was that on the WLC the front and rear brakes were the same and could be quickly interchanged. 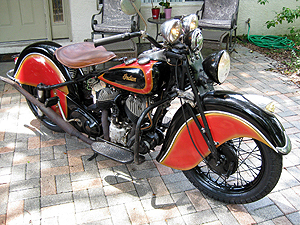 Another difference (that I only confirmed in 2014) was that most of the WLC's had (installed by Canadians after the bikes were delivered from Wisconsin USA) a lever and cable operated hand actuated clutch like English and all modern bikes instead of the foot treadle; however the shifter remained on the L side of the fuel tank and no further modifications were made by Canadian mechanics; meaning to change gears you pulled in the left lever and rolled off on the right throttle and reached across with your right hand to operate the shifting lever. (I guess it took three to five seconds to change gears this way as I have practiced using a clock.) 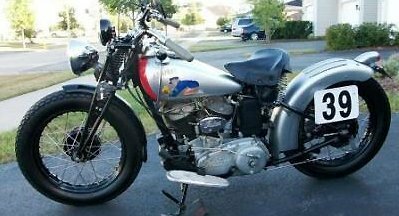 I know this sounds "stupid" and in-credible but my Dad insists he rode that way in the War and an expert from the Canadian Vintage Motorcycle Club has confirmed this with me. 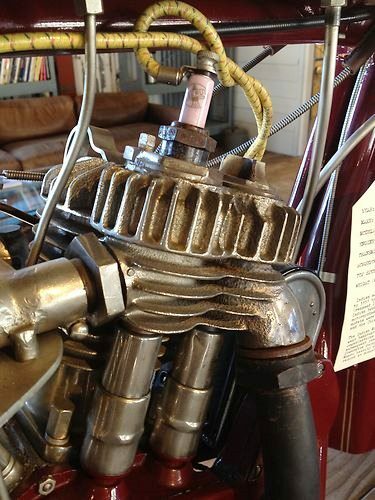 Seems to me they could have left the clutch treadle in place so that once one was accelerating and ready to shift out of first, or downshifting into first when de-celerating, the foot cltuch and left left hand could have been used to shift out of 1st gear or into 1st. (to avoid reaching across and down with the right arm) I forgot to ask these two men if the front brake lever was still on the left (as per WLA and typical American foot operated clutch MCs) or had been switched over to the Right side which is common on modern bikes where there is a clutch lever on the left. Presumably not wanting two levers interfering with each other the brake was moved to the right. So that would be a third difference between the WLC and WLA. 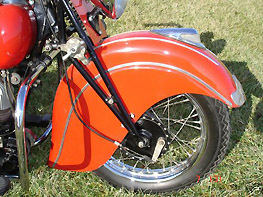 According to the expert, yet another difference was that the WLC's had passenger footpegs mounted just behind the rider's footboards and another set further back and a padding on the rear fender carrier so that two passengers could be carried. 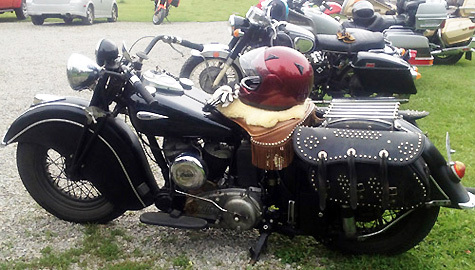 (Rider on tank, 1st passenger on seat, 2nd passenger on carrier bolted to top of rear fender) Apparently Canadian MC riders got so used to this they always sat far forward, basically atop the fuel tanks. 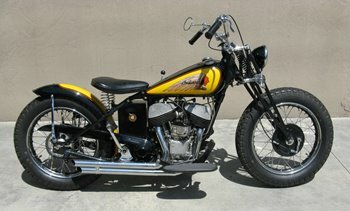 Having seen the extremely low power of WWII Harley and Indian 500 and 750 flathead engines it is hard to believe they could have carried three people, but I suppose with low gearing and slow acceleration and a top speed of 30 miles per hour (50 or so with no passengers) is better than walking. Visit this website every few months for more details on the WLC. Beware of mongrel WLC/WLA cross-breeds if buying. 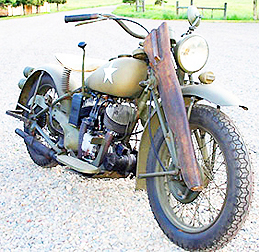 According to motorcycle historian Allan Johnson, (CVMG News, Dec. 2013 edition) there were up to 25,000 model 741s made, and most were provided by the US government under a "lend/lease" program to several Allied armies. 7,600 went to the UK, 1000 to India, 4,200 to Australia, 3,600 to New Zealand, about 900 to the Middle east, 370 to Malaya, 260 to Belgian Congo, 670 to Polish forces in Britain, etc. That leaves over 6,000 unaccounted for, some - I am guessing a few hundred - were sold to the Canadian army and the rest remained in the US (civilian or military). Apparently about 5000 were sold to the US public by the War Dept. as surplus even before the end of WWII. 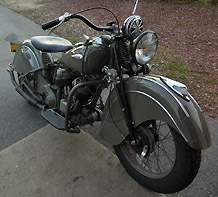 A small number of 640 and 340 Indians (some with sidecars) were also bought by the Canadian Army circa 1940 - 41 as well as 90 Harley ELC's (slightly modified model EL, being 1000 cc OHV Knucklehead). When the Nazis conquered most of France, they expropriated the Indian Chiefs (model 340) that the French army had aleady received and online there is a photo of about twenty Wehrmacht troops riding French Indian Chiefs with sidecars. 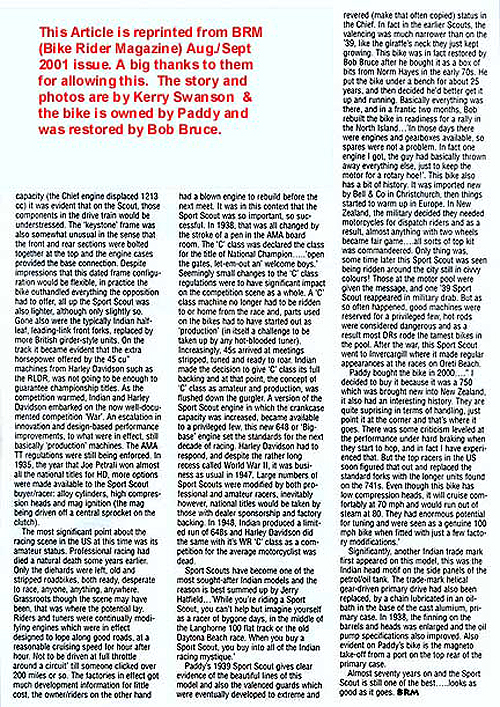 Must have seemed interesting and a bit crude to them after their shaft drive 4 speed plus reverse R75 BMW's. 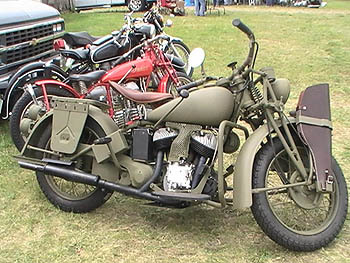 Between 1940 and 1943 inclusive, the Canadian Army ordered 18,650 Harley WLC machines. (figures from Al Johnson's article in Nov. 2013 edition of CVMG News). 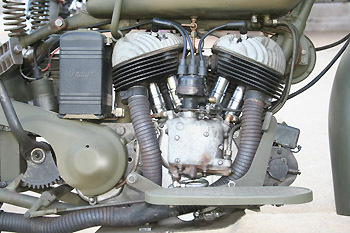 The WLAs (750 cc commonly referred to by civilians as the "45" for 45 cubic inches) may have also been supplied to Allied countries other than Canada, e.g. the UK, Australia, New Zealand, South Africa, India. 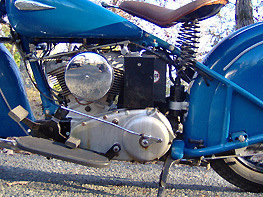 The solo versions were supplied with a sidecar gearbox sprocket (in the saddlebag) to allow a sidecar to be used if desired. 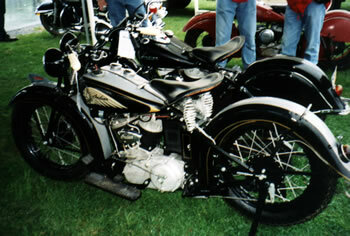 In the British Army they used their own Matchless and Norton and BSA 350 c.c. 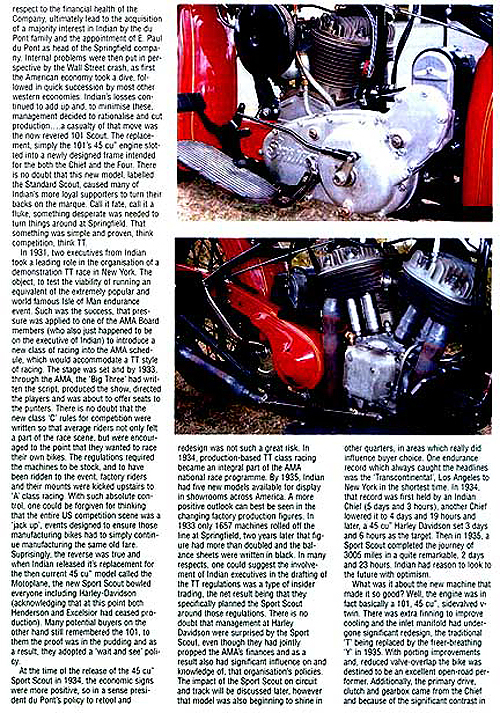 singles, along with a few Indian models for the Air Force according to a Classic Bike article. 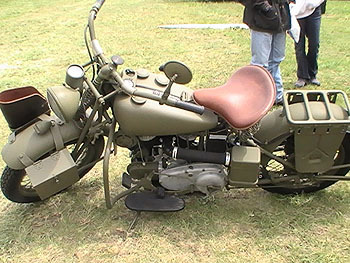 Note that two of the photos I took at Oley in 2012 shows a US model 641 or 741 with the rifle holder on the right of the fork, a metal box on the left fork (for ammo, medical supplies, maps?) and a mesh covering the distributor. 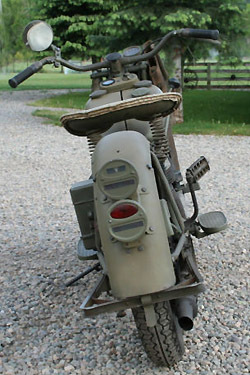 These modifications do not appear on most Canadian and US military models. 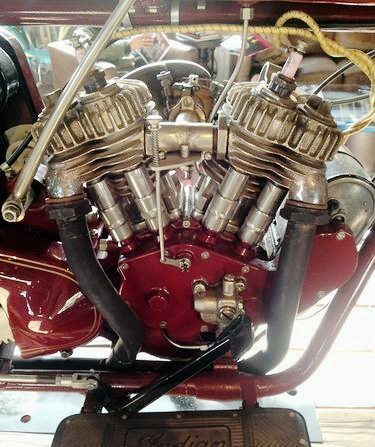 The last four shots in this cluster are of a 641 restored by Jeff Grigsby of Indian Motor Works, offered on Ebay in very late 2012. 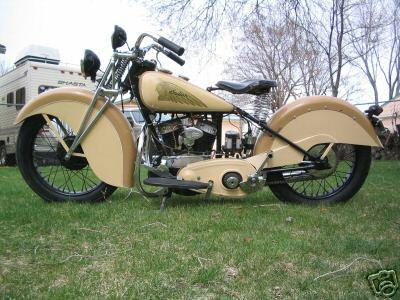 I suspect the white color of the seat is incorrect as is the metal corrugated flexi-hose over the exhaust pipe headers, but otherwise an impeccable restoration. Next is a photo from about 1997 showing me and my then two year old daughter being given a ride in a Canadian Army Indian Scout by Harold Carlaw at his museum in Campbellford, Ontario, Canada. It had a fair bit of "pep" so must have been a 750 rather than a 500. 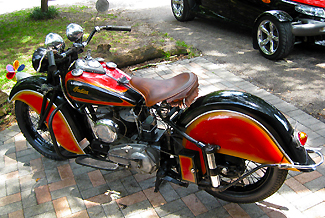 As discussed above, during WW II the Allies used lots of Harley 45 Cubic Inch Displacement (750 cc.) motorcycles and some Indians of 500, 750 and 1200 cc (30.5, 45 and 74 CID). 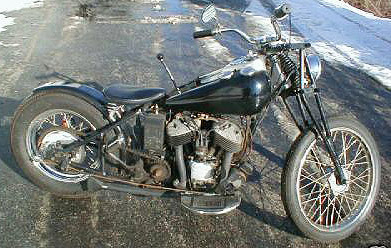 The rare Indian 841 was a transverse rather than in-line V, with other Moto-Guzzi-like features such as shaft drive and foot shift and cylinders at a 90 degree angle, but the barrels and head were not new and were from the 750 Scout. 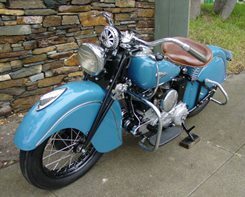 The 841 never saw action (neither did the competing Harley which was like a copy of a German army BMW or Zundapp) and only about a thousand were built. 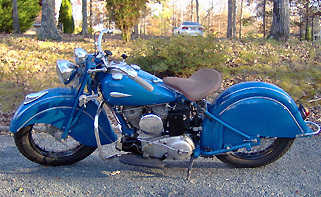 Much more common were the model 741's of 500 cc and the model 641's of 750 cc. Confusing nomenclature, as one would expect the 642 to be a 500 or 600 cc. 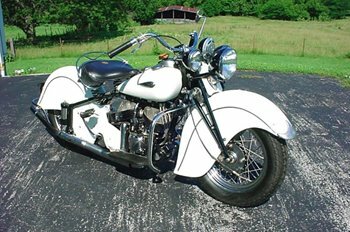 built in 1942 and the 742 to be a 700 or 750 built in the same year, but Indian seemed to lose its logic during WW II and never recover from it. They marketed the 500 c.c. 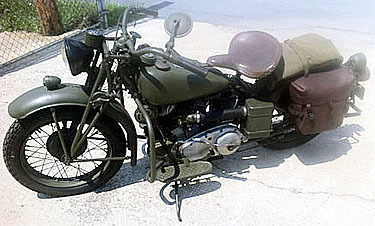 army model 741 (in civilian name "Pony Scout") first (to the allied armies) thinking that it being ligher and smaller it would be preferred, but it was so underpowered and likely only a few pounds lighter than the 750 cc 641 that the American and Canadian armies stopped ordering them. However in Western Europe, especially England, and in New Zealand and Australia one finds many 741's still running around. In New Zealand there is a big racing scene around them. 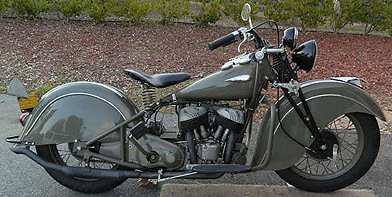 There are also a lot (relatively speaking, meaning "a few") of army Chiefs in North America, but compared to the Indians, ex-army Harley 45's were and are more common. 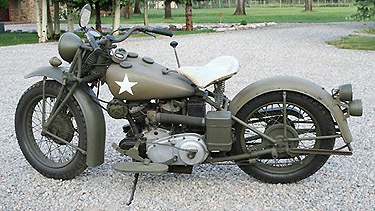 After WWII there was a plethora of ex-military vehicles for sale cheap, and many trucks, jeeps and motorcycles were bought as war surplus (cheap) by civilians, and put to work. They were all repainted from the olive drab or khaki (or dull gray or blue Navy or Air Force colors) into bright civilian colors. 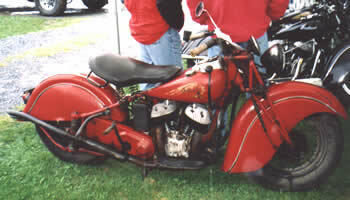 Indian motorcycles tended to be painted red. Most of the trucks seem to have been worked to death and expired but the MCs tended to last. After the war and to this date, people have been "civilianizing" the 640's and 741's, prettying them up and making the 30.5 inchers into Pony Scouts and the 45 inchers into Sport Scouts. In the UK and New Zealand and Australia there are still a lot of these old 500 and 750 Souts running . A typical example is what is seen in the photos below. 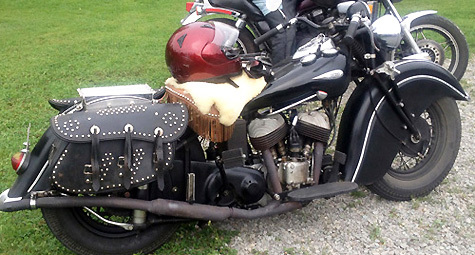 In Nov 2014 an American bought the bike below from NZ and exported it to the SW USA and then put it on Ebay. 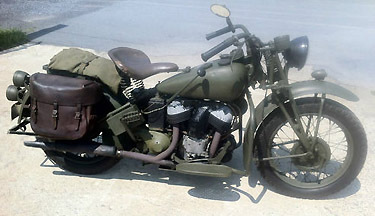 It is a civilianized US Marine Corps Scout (listed as a 1941, a model 741 meaning 500 c.c.) Although civilianized he says it still has the blackout lights. 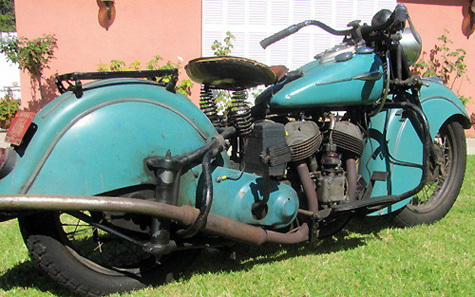 $15k was the reasonable asking price for this piece of mobile history and riding fun. Here are some YouTube videos copied on 30 Dec. 2012. 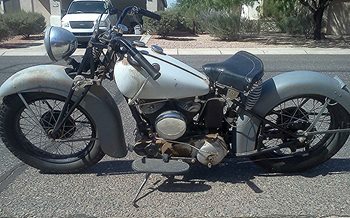 First is of a guy starting and riding off on a 1941 Harley WL painted in desert sand color, and second is a guy starting and riding off on a civlian Harley 45. 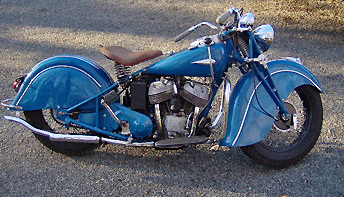 Then is a 1942 civilianized Indian 741. Then a "Chout" bobber. Looks great, sounds great, goes around the corners fine and only weighs 370 lb. 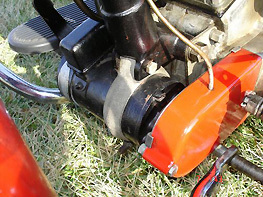 A Chout has Chief 74 CID flywheels and connecting rods in a Scout engine, making 950 c.c. or 57 CID. I wonder whether 80 inch Chief would also work? Presumably you'd have to put base spacers in to lengthen the barrels, or shave metal off the tops and bottoms of the pistons. 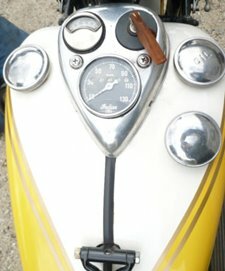 Such is the fun of modifying a motorcycle. If anyone has ever made a Chout using the 80 inch Chief bottom end, let me know.